What's better than a cheese ball? A cheese ball (or two or three) for every guest! 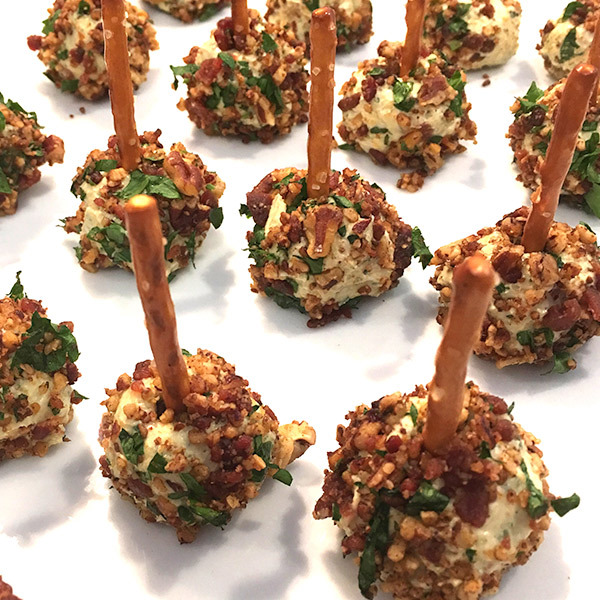 There's lots to love about these Mini Bacon Cheese Balls served on a pretzel stick: jalapeños, cheese, ranch seasoning, pecans...and did we mention bacon? If you don't want to roll out all the balls, simply spread the cheese ball mixture in a dish and top with the pecan-bacon mixture for easy dipping. These perfectly poppable cheese ball appetizers are sure to be one of your most-requested party recipes. So fun! So yum! Heat a large skillet over medium-high heat. Add bacon and cook until brown and crispy, about 6 to 8 minutes. Transfer to a plate lined with a paper towel. In a small bowl, combine half of the bacon, pecans and 2 tablespoons parsley. Set aside. In the bowl of an electric mixer fitted with the paddle attachment, beat cream cheese, cheddar cheese, goat cheese, jalapeños, ranch dressing seasoning, Worcestershire sauce and remaining bacon and parsley on medium-high until well combined and fluffy, about 1 to 2 minutes. Cover and place in the refrigerator for at least 2 hours or overnight. Shape the mixture into teaspoon-size balls and roll in the prepared bacon-pecan mixture. Pierce with pretzel sticks and serve. * Try adding spices like chili powder, smoked paprika and garlic and onion powder to the pecans and smoking them first. Smoking your jalapeños instead of roasting them also gives additional depth of flavor to this recipe.